Learn how you can work together on prospects and campaign in Reply so that all your team members could easily access and manage the data. In Public mode, prospects are shared between all team members. 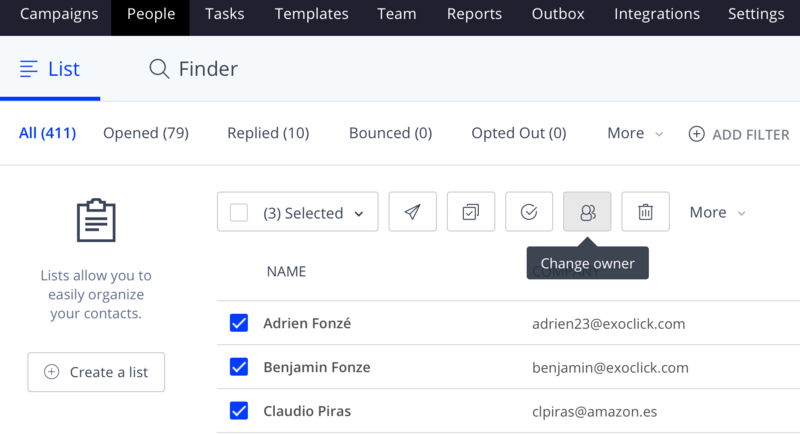 Each team member has equal rights to create, edit, and delete prospects. Each prospect has its owner. You can see who is the owner of the prospect by enabling the Owner column in the MANAGE TABLE COLUMNS drop down menu. When you hover over the Owner icon, you see the full name of the owner. Campaigns which the prospect is currently active as well as historical campaigns. Prospect statuses in each campaign, campaign owner, Opens and Replies metrics. This information helps you treat your prospects more personally, see to what kind of information they are the most sensitive and and reduce the chances of losing them due to sending too many emails. In Public mode, team members can see campaigns of all team members and their metrics. Each campaign has its owner. You can see who is the owner of the campaign in the OWNER column. When you hover over the Owner icon, you will see the full name of the owner. In Public mode, you can push the same prospect to different campaigns simultaneously. However, there is a rule: a prospect can be only in one campaign of each team member. You can use this feature when you address your prospects by different matters simultaneously - for example, one team member pushes the prospect into a marketing campaign, and another team member sends security updates emails.